With the exception of dedicated film extrusion lines, the vast majority of blown film lines are designed for film structure versatility where two or more film products can be manufactured on the same line. This line versatility allows processors to make more product with ‘just-in-time’ delivery and carry less inventory, which helps processors combat rising resin prices. What this also means is producing films with much shorter runs and more frequent material and colour changes; all of which, can prove to be costly if handled inefficiently. 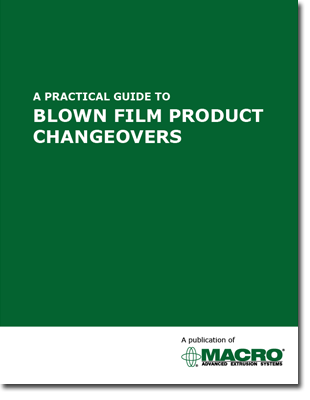 Download Macro's Blown Film Product Changeovers Guide for advice to help you improve the efficiency of your product changeovers. Written by Macro's Director of R&D, Dr. Harinder Tamber, the guide includes recommended purging procedures and tips for asking the right questions for improving your process. Download your free copy using the form to the right.